Hooray for creepy Halloween dessert ideas! 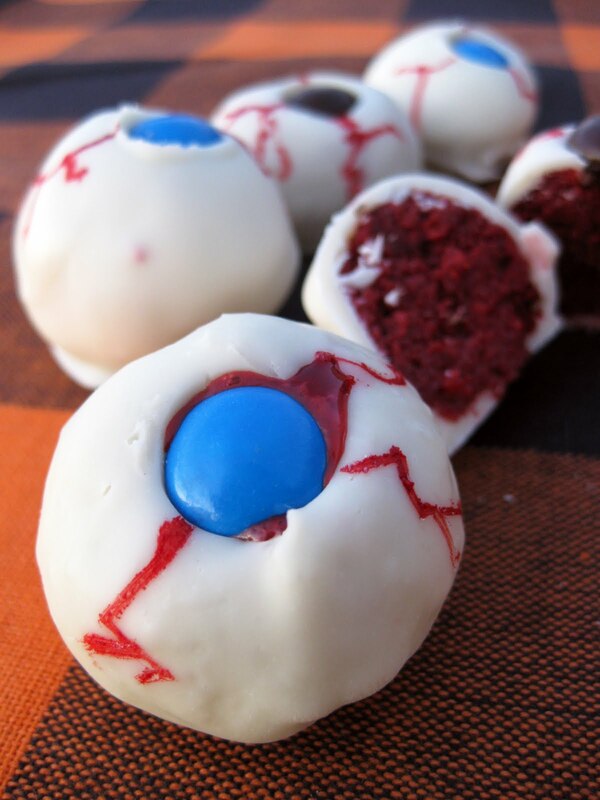 As far as Halloween desserts go, eyeball cake balls hold a special place in my. . . skull. They're gross looking PLUS these edible eyeballs are super tasty. A double win for the Halloween table. While you won't have to explain what they're supposed to be, you might have to explain what's in them, before anyone will venture a bite. The idea for edible eyeballs came from a friend who forwarded me the recipe for forkable's rice crispy peanut butter eyes. But after a little brainstorming, it occurred to me that a much grosser version of the eyeball cake would have a moist red interior: red velvet cake! Gross and nasty! Wonderful! Fact: I was so proud of this idea. I was so excited! I called my mom so that she would tell me how awesome I was. Fact: A single search of the internet told me that a few other people have had this idea, too. Oh well. Great minds think alike? Besides, let's focus on craftsmanship. 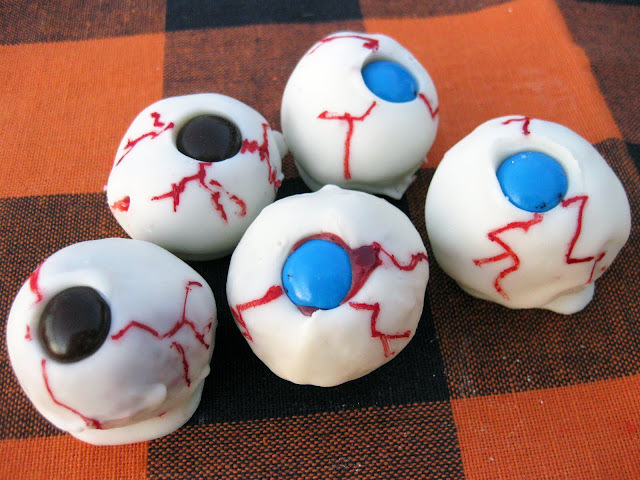 I think I bring a special level of finesse to edible Halloween eyeballs. Gruesome red-velvet cake ball interior...best Halloween desserts ever! Okay, so you want to know what's in these things? Let's talk details, kids. Time for an anatomy lesson. Halloween dessert ideas: cake balls recipe turns into edible eyeballs. What do people think when you serve a plate of Halloween eyeballs? Some people become ecstatic and hold them in front of their eyes. Some people are so sickened by this gross Halloween food that they can't bring themselves to try a single tiny eye cake. Those people are missing out. These are delicious! They're sweet and moist, and the combination of red velvet cake, cream cheese frosting, and white chocolate goes down great with a glass of witches' brew. 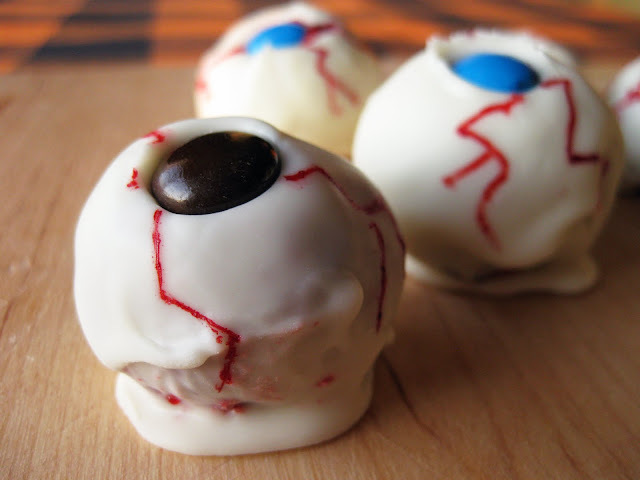 The main eyeball cake ball recipe drawback is that the eyes take a while to make. Forget about making the family cake recipe from scratch...bust out the cake mix and ready-made frosting for this project. Don't have red velvet cake mix on hand? No worries. I made one batch with vanilla cake mix, added 2 oz of red food coloring to each, and called it good. They turned out as well as the red velvet eyes did. The "blood clot" in the middle eye happened when some of the frosting-y cake melted after I dipped it in the hot white chocolate coating. Yay for gross Halloween food ideas! Imagine all the fun things you could do with a plate full of these! Bake the cake according to directions and let cool completely. Once cooled, crumble it into a large bowl or large tupperware, making sure no large bits remain. One method to quickly crumble cake is to rub two chunks of it together. Scoop 3/4 of the container of frosting into the cake and mix thoroughly using a spoon. The rest of the frosting isn't going to get used. Enjoy it. Put plastic gloves on now, because you'll end up with red hands if you don't. Next step: "Roll your eyes," hardy-har-har. Roll the cake into eyeball-sized balls, place on a wax paper or parchment paper-lined cookie sheet, and cover with plastic wrap. Refrigerate for several hours or freeze for 15 minutes. While they are chilling, prepare the chocolate coating. Melt the paraffin wax in the microwave. Pour the hot wax over the chocolate chips and melt the whole ensemble until smooth using a method of your choice: Either place it in a pan over low heat, use a double boiler, or microwave it. In any case, be sure to stir frequently and heat carefully, as the mixture can burn easily. Once the chocolate mixture is melted and smooth, take a few eyeballs out of the fridge or freezer. My preferred method for dunking these treats was to drop them in the coating, fish them out with a spoon, stick a toothpick into them, and transfer via toothpick to a wax paper-coated cookie sheet. Only dunk one eye at a time, and have the M&Ms at the ready, because the coating hardens quickly. Press an M&M into the middle of the eyeball to make the pupil. Once you're done with all the eyes, draw the blood vessels: Break a toothpick in half to provide a wider "brush" surface to paint with, dip it in a dish or cup that contains several drops of red food coloring, and paint away! You can use Gulf Wax brand paraffin if you can find it (often alongside canning supplies in your local grocery or hardware store) -- that is one of the most commonly used wax brands for candy-making. Without a little paraffin, the outer chocolate shell might not harden properly. I haven't tried any other substitutes, but a review of what others have tried on the web suggests that crisco might work (since it's liquid at high temperatures but becomes harder at room temperature) -- however, crisco at room temperature is not rock solid like wax is at room temperature, so while the coating will stiffen up, it will likely still be a bit soft. If you do use Crisco and make the recipe using the 24 ounces of white chocolate called for, try using 5 Tablespoons and 1 teaspoon of Crisco. This is in proportion to what a home baker reports to have successfully used to make a chocolate coating for buckeyes (according to their comments in this recipe: http://www.food.com/recipe/best-ever-buckeyes-16716). But best to keep them refrigerated until ready to serve! To clarify, the total amount of crisco to use is 5 Tablespoons plus 1 teaspoon. That is the suggested amount to be mixed in with 24 ounces of white chocolate!